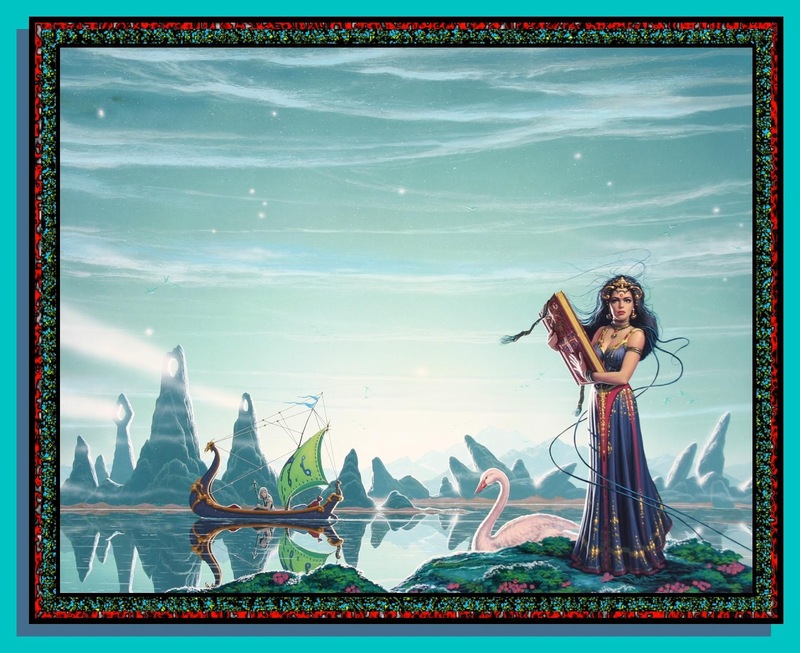 My father and I just finished The Sorceress and the Cygnet by Patricia A. McKillip, the first book of her Cygnet Duology. I am in awe. Again yet more so. Usually when reading a McKillip book it feels as though Ages of the World pass between pages, so great is per poetic power over atmospheric language. Yet this tale under cygnet and star transcended time in such a fashion that it felt like we have been reading it forever, with Ages passing so swiftly that they became meaningless. In this book, stories old as Ro Holding and woven out of stars spring to life, confounding the very grounded and yet beautifully intricate Ro House as Wayfolk man is compelled to aid these powers for the return of his love. Thus an epic tale is born as a realm is threatened, all without marching armies or a trace of civil unrest. A tale which teaches a most important lesson: Some powers are meant to be known and not used, and in some areas it is better to make the choice to stop learning; and with every heart you burn knowingly it is your own you cast into the flames. May the stars watch over you Corleu of the Wayfolk, Meguet Vervaine, Nyx Ro, the Gatekeeper, Rush Yar, Calyx Ro, Holder Lauro, Iris Ro, and Tiel of the Wayfolk. 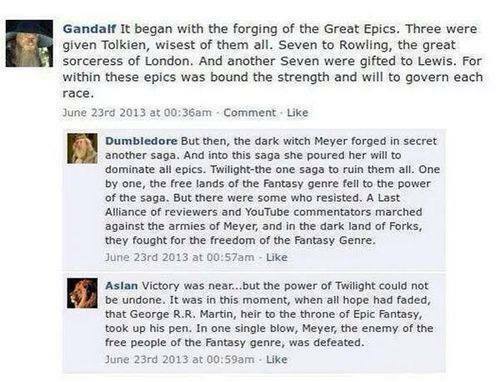 Not that I am an avid fan of Twilight either, but in my opinion it was not even true Epic Fantasy; rather it was Dark Fantasy blended with Romantic Fantasy and thus could never have challenged Tolkien. Sometimes I am asked where in Tolkien's Middle-earth, or any Fantasy world for that matter, I would like live. Naturally barring worlds of my own creation, I think the answer would be Dol Amroth in southern Gondor. 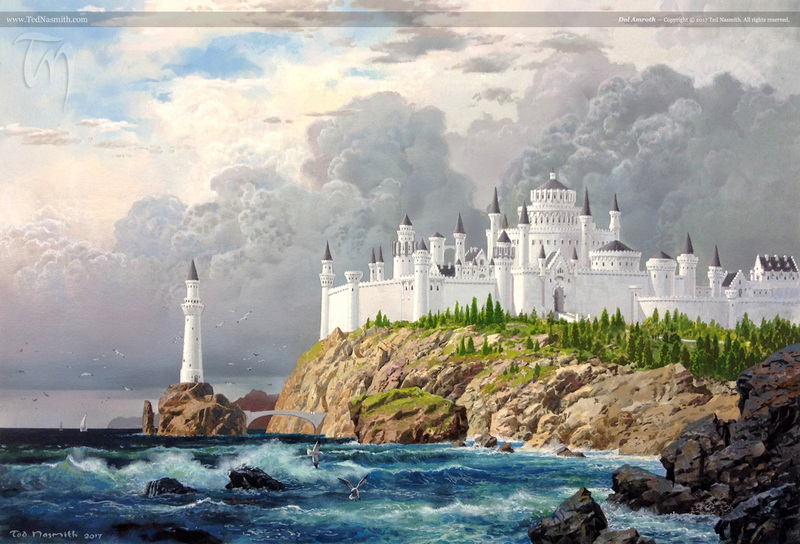 As Ted Nasmith's illustration shows, it is a scenic place with both natural and human-made wonders. Human and Elf, that is, for the place is also steeped in the lore and tradition of the Elder Kindred; indeed, the first people to live the region were the Sindar (Grey Elves) escaping south from the wars against Morgoth that characterized the First Age. 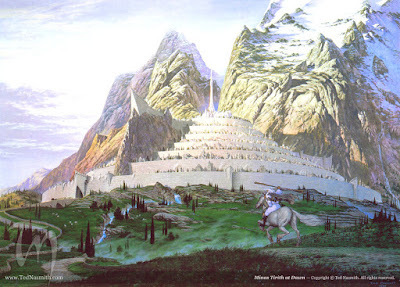 As to the inhabitants during the War of the Ring, the people of Dol Amroth are tall, grey-eyed, dark-haired, and the most skilled harp players in all of Gondor (playing at the coronation of Aragorn). Furthermore, and going back to Elf-lore, the inhabitants of Dol Amroth and in the lands nearby are some of the few people of Gondor who speak Sindarin (one of the two primary Elf languages) on a daily basis, and are generally regarded as having Elvish blood in their veins. One may also recall Prince Imrahil of Dol Amroth from The Return of the King. Bringing a company of his Swan-Knights and 700 infantry to Minas Tirith, he led the sortie that rode to the aid of his nephew Faramir whose warriors were retreating from Osgiliath when Sauron overran the Pelennor Fields, personally rescuing Faramir himself. He then aided Gandalf commanding the defenses, perceived that the Nazgul-stricken Éowyn still lived, and recognized that Aragorn was the rightful King. Finally, Imrahil led the city for a while himself before Aragorn's crowning, took part in the Battle of the Black Gates, and was recognized by Legolas as being of Elvish descent. So there it is. 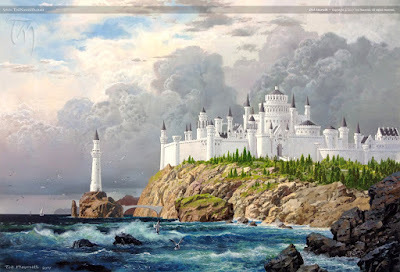 I would live in Dol Amroth, the peaceful yet strong and noble, even idyllic, province of Gondor. I have always liked the sea, love music, and cannot think of a place that better blends the beauty of civilization at its best with the wonder of the natural world; all augmented by the lore surrounding the place. Also and on a side note, Prince Imrahil is one of my favorite secondary characters in The Lord of the Rings. Ursula K. Le Guin meant much to me. Tolkien shaped my inner language, yes, yet Le Guin helped chisel it into strong, philosophical clarity. As I said when she died in January, She was one of the best. I remember first reading The Earthsea Cycle in elementary school, hearing Ogion of Re Albi say “To hear, one must be silent.” And I still remembered those words when I took the series up for a second and third time. While the rest of my generation went to Hogwarts with Harry, (after I left Tolkien's Middle-earth) I traveled by ship to the School of Roke with Ged. 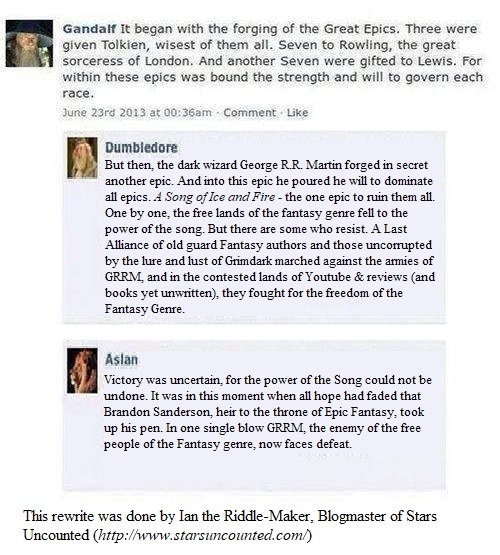 Some say that Rowling was the first master Fantasist author who dealt with death and the those who will burn the world if need be to cheat it. They are wrong; for, long before Voldemort fashioned his horcruxes, the wizard Cob's reckless quest for immortality halted the words of power, tearing a rift between life and death – endangering the living. Long before Harry the Chosen One fought Voldemort, Archmage Ged fought Cob. And she remains one of the few master Fantasists whose primary world and cast of characters are non-White (with the exception of Tenar from the Kargad lands). 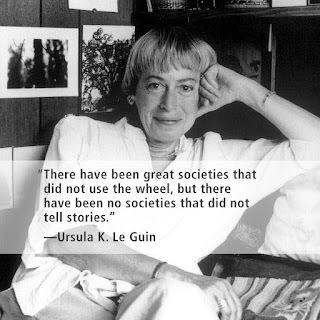 Indeed, Le Guin has criticized what she describes as the general assumption in fantasy that characters should be White and that the society should resemble the Middle Ages. I owe Ursula K. Le Guin my own Fantasy series, the one I wrote and am still in the process of editing, for without Earthsea it would never have existed. Started I have again and to my joy The Return of the King, third and glorious final of J.R.R. Tolkien's The Lord of the Rings trilogy. Where, at last, one in introduced to arguably the most famous city in Fantasy genre: Minas Tirith. the crownless again shall be king." - A verse written by Bilbo in reference and tribute to Aragorn. From the plains Rohan and the Battle of Helm's Deep, to the wondrous Ents and the fall of Isengard, to the dark terror of Shelob Ungoliant's Daughter up the Stairs from Minas Morgul. One again I have finished The Two Towers, second of J.R.R. Tolkien's The Lord of the Rings trilogy. "The realm of fairy-story is wide and deep and high and filled with many things: all manner of beasts and birds are found there; shoreless seas and stars uncounted; beauty that is an enchantment, and an ever-present peril; both joy and sorrow as sharp as swords." "Killing the strong to prove your strength is foolish weakness. Killing fools is easy weakness. Killing the weak is evil weakness. Accomplished your ends without killing, mastering your mind when you want to kill - that is strength!" "Some heroes are born, some are made, and some have heroism thrust upon them." Never underestimate the power of a tale. What you put aside as fantasy in one land can kill you in the next. "Set your course by the stars, not by the lights of every passing ship." "If you want your children to be intelligent, read them fairy tales. If you want your children to be more intelligent, read them more fairy tales." "People who deny the existence of dragons are often eaten by dragons. From within." "Everyone and everything has a time to die." The majesty of the stars is used in fantasy. But that does not make it fantasy. Stars Uncounted © 2016-2019 All Rights Reserved. Simple theme. Theme images by A330Pilot. Powered by Blogger.